Question: How do we create an electric motor? Hypothesis: We think we can create an electric motor by using a battery, magnet and copper wire. We think that our electric motor will work because the electricity will flow from one end of the copper wire and continue infinitely in a loop powered by the battery and pulled by the magnet. The copper wire heats up after spun around for a certain amount of time.Be careful not to touch. First get a copper wire, neodymium magnet, AA battery and needle nose pliers. Cut the copper wire and create a shape. Attach the magnet to the bottom of the battery (negative). Place the copper wire on the battery. 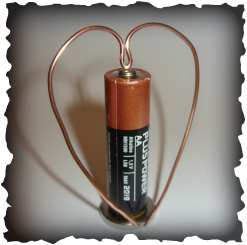 Make sure the copper wire is touching the top of the battery (positive) on the top end and the magnet at the bottom end. 5.Now, enjoy as you watch it spin around and around. Nothing special is required for this experiment. The homopolar motor was the first electrical motor to be built. Michael Faraday demonstrated its operation in 1821 at the Royal Institution in London. A homopolar motor is a direct current electric motor with two magnetic poles. The homopolar motor is driven by the Lorentz force. A conductor with a current flowing through it when placed in a magnetic field which is perpendicular to the current feeds a force in the direction perpendicular to both the magnetic field and the current. This force provides a torque around the axis of rotation. Because the axis of rotation is parallel to the magnetic field, and the opposing magnetic fields do not change polarity, no commutation is required for the conductor to keep turning. The reason the copper wire spins is that an electric current is flowing from the positive area of the battery and the negative and into the magnet. The current then flows from the middle of the magnet to the edge where the wire connects, it travels up the wire back to the positive area of the battery. The circuit is then complete. In conclusion, by using everyday materials and science we are able to create a homopolar motor. We have learned that electricity flows in a endless loop to create a motor. Anthony T. is a fifth grader in Mrs. Luke's class who loves to play soccer, baseball and also is on the wrestling team. Anthony C.is a fifth grader in Mrs. Colella's class. He plays football and baseball. Liam is a fifth grader in Mrs. Luke's class. He likes to read, write, play soccer and play video games. Procedure: Explain what materials that you "need to get". Need to be more detailed, and explain why you are doing each step. How to you attach the battery? Where do you attach the batter?